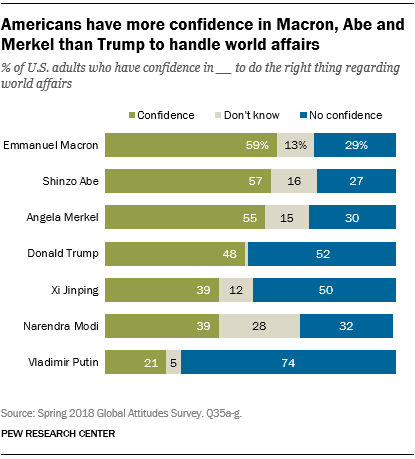 Americans have more confidence in the leaders of France, Japan and Germany to do the right thing regarding world affairs than they have in U.S. President Donald Trump, according to a Pew Research Center poll conducted earlier this year. 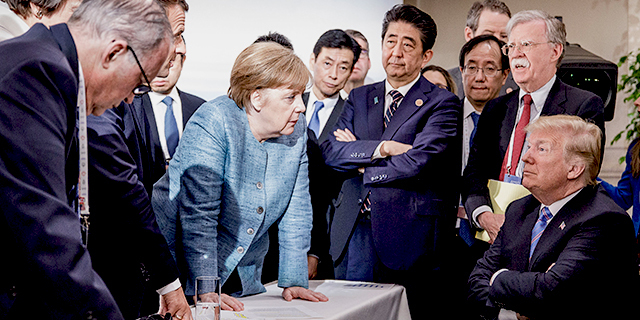 Majorities in the U.S. view French President Emmanuel Macron, Japanese Prime Minister Shinzo Abe and German Chancellor Angela Merkel with confidence, while about half (48%) are confident that Trump will do the right thing internationally. Still, Americans are more likely than others around the world to have confidence in Trump: Across 25 other surveyed nations, a median of just 27% have confidence in the U.S. president. Of the seven leaders tested in the survey, Americans have the lowest levels of confidence in Russian President Vladimir Putin, with about one-in-five (21%) saying he will do the right thing in world affairs. Chinese President Xi Jinping and Indian Prime Minister Narendra Modi receive equivalent ratings: About four-in-ten (39%) in the U.S. have confidence in each. Opinions about world leaders in the U.S. are often tied to party affiliation. For example, roughly nine-in-ten Republicans and Republican-leaning independents (88%) are confident in Trump to do the right thing regarding world affairs, but among Democrats and Democratic-leaning independents, just 16% say this. Republicans are also slightly more likely than Democrats to have confidence in Putin and Abe. However, two-thirds (67%) of Democrats have faith in Merkel to do the right thing regarding world affairs, while 47% of Republicans say the same. Merkel recently announced that she is stepping down as her party chair and will not seek re-election as German chancellor. 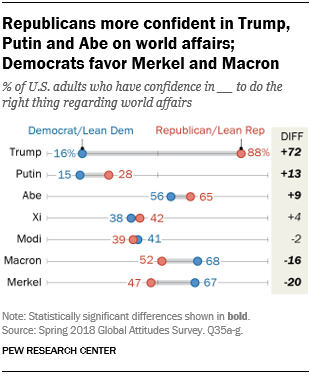 Overall, Democrats have more confidence in the leaders of France, Germany, Japan, India and China on world affairs than they do in their own president. 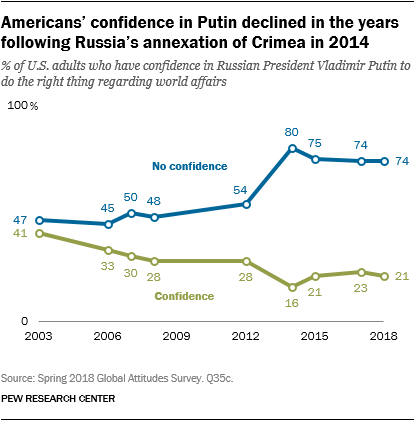 Americans have generally lacked confidence in Putin in surveys conducted over the past 15 years, but their opinions have been especially low since Russia’s 2014 annexation of Crimea. That year, only 16% had confidence in Putin. All interviews were conducted after Putin’s March 2014 statement that Russia would annex Crimea. In each year since then, around one-in-five Americans have reported confidence in Putin. 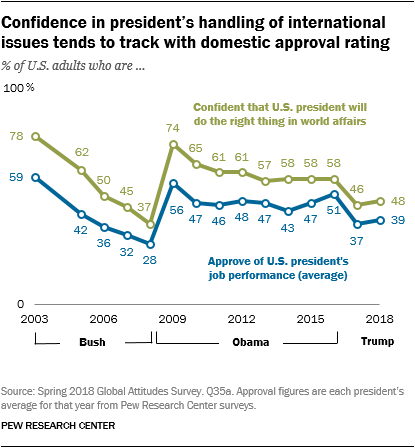 When it comes to Americans’ trust in their own president on the global stage, views have fluctuated widely over time, mostly shifting with the domestic approval rating of that president. For example, in 2003, 78% expressed confidence in George W. Bush, but that gradually declined as the Iraq War eroded his popularity. By the end of his second term, only 37% of Americans had confidence in Bush’s ability to handle world affairs. Still, confidence in Bush’s global abilities tracked 9 to 20 percentage points higher than his overall domestic approval ratings throughout his presidency. The same pattern was true for Barack Obama, although Obama’s ratings were on balance higher and steadier than those of his predecessor. They peaked shortly after his election, when 74% of Americans had confidence in Obama to do the right thing internationally and 56% approved of his job performance. While these numbers slipped after the first year of his presidency, around six-in-ten Americans remained confident in Obama on the global stage throughout the rest of his two terms, while his domestic approval ratings hovered in the mid- to high 40s. So far, Donald Trump has received lower international confidence ratings than Obama, but they are still higher than his overall approval rating in the U.S. In 2018, 48% of Americans have confidence in Trump’s international abilities, while his average job performance rating is at 39%, according to recent Pew Research Center surveys. As with presidential approval, there have long been wide partisan gaps in confidence in the U.S. president on the world stage. In fact, in 12 of 14 surveys conducted since 2005, no more than around a third of adults in the opposing party have expressed confidence in the president to do the right thing regarding world affairs (the exceptions are 2005 under George W. Bush and 2009 under Obama). 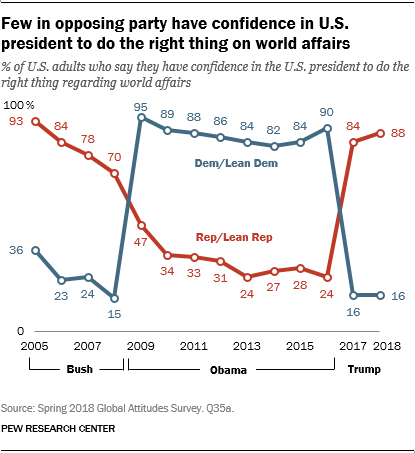 Yet the partisan gap in views of Trump is wider than for either Bush or Obama over this timeframe: Currently, only 16% of Democrats have confidence in Trump in world affairs, compared with 88% of Republicans. Moira Fagan is a research assistant focusing on global attitudes at Pew Research Center.